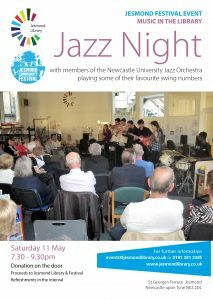 Members of the Newcastle University Jazz Orchestra return for another evening of their favourite swing numbers. Collection at the door to the support the Library. Sally Ingram and Jack Green of Newcastle University on what it is like to be a student living in Newcastle, the support available from the university, including issues of student mental wellbeing, and the ways that permanent residents can help. Donations for the Library. Drop in 10am to 4pm. Open to the public. Interactive drop in session, hosted by Dementia Friendly Jesmond. Discover what’s happening in Jesmond and Newcastle, and say what else you’d like to see. Keith Jewitt gives a brief survey of the Pre-Raphaelite artists and collectors who were active in the North East between 1850 and 1900. Donations please! A seminar sponsored by Newcastle University with speaker Alistair Ford, who will discuss the challenges we need to tackle to ensure urban sustainability, followed by discussion. Alistair is a researcher in the School of Engineering, specialising in climate change.